224 pages | 49 B/W Illus. In order to address the twenty-first-century challenges of decarbonisation, energy security and cost-effectiveness it is essential to understand whole energy systems and the interconnection and interaction between different components. An integrated language is therefore needed to assist energy policymakers and to help industrial stakeholders assess future energy systems and infrastructure and make realistic technical and economic decisions. 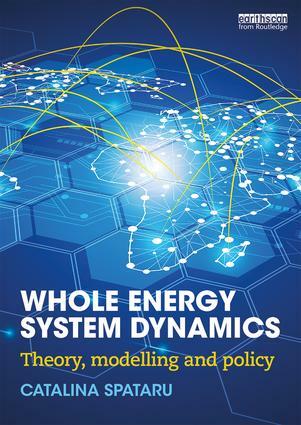 Whole Energy System Dynamics provides an interdisciplinary approach to whole energy systems; providing insights and understanding of it in the context of challenges, opportunities and solutions at different levels and time steps. It discusses approaches across disciplinary boundaries as well as existing issues within three main themes: theory, modelling and policy, and their interlinkage with geopolitics, markets and practice. Spataru argues that there is an urgent need for a whole energy system integration. This is necessary for effective analysis, design and control of the interactions and interdependencies involved in the technical, economic, regulatory and social dimensions of the energy system. This book is essential reading for students interested in the area of energy systems, policy and modelling. It is also a valuable read for policymakers, professionals, researchers, academics, engineers and industrial stakeholders. "This book comes at a time when there is an urgent need to have a complete rethink of our future energy options. It cuts through the ingrained perceptions hindering our move from fossil fuel to sustainable forms of energy. This book, which integrates theory, practical perspectives, modelling and policy aspects and links traditional engineering ways with the very latest developments, will be a beacon in our quest for a secure and sustainable energy future." – Trevor Letcher, Emeritus Professor of Chemistry at the University of KwaZulu-Natal, Durban, South Africa and a Fellow of the Royal Society of Chemistry. 8. Why do Mathematical Modelling? Catalina Spataru is a Lecturer in Energy Systems and Networks at UCL Energy Institute in London, UK, Course Director of MRes in Energy Demand Studies at UCL and Group Leader of Energy Space Time Group. Her expertise is in whole energy system dynamics, with great interest for regional interconnections (EU, West Africa, MENA countries, Latin America) and market integration, future energy development in emerging economies, reliability and security of future energy systems and with particular interest in the interaction of water–energy–land nexus to assess water scarcity problems in risky countries like Brazil, Jordan, Egypt. She regularly delivers presentations in academic and professional circles, public engagement events and for the media, recently visited Princeton University and MIT (USA), spoke at Cheltenham Science Festival and was interviewed by the Sunday Telegraph. Currently she teaches Smart Energy Systems for MSc EDE students at UCL, a multidisciplinary module that she proposed and developed in 2013. This multidisciplinary module provides students with an understanding of the methods, concepts and practice of whole energy systems, offering a combination of theory, modelling interactive exercises and case studies. Also she teaches Communication Skills to MRes EDS students and Metrics, Modeling and Visualisation of the Resource Nexus module for the ISR MSc sustainable resources programme. She supervises MSc, MRes and PhD students. She is the regional representative of the IEEE Women in Power (Region 8 – Europe).